A new kind of countdown has begun. Carlsbad, CA-based ViaSat (NASDAQ: VSAT) says it recently transmitted the first test data to ViaSat-1, the highest capacity communications satellite ever launched into space. The satellite, launched Oct. 19 from Russia’s Baikonour Cosmodrome, successfully relayed e-mail, streaming video, and Web browsing data to ViaSat’s WildBlue high-speed data network. In a statement today, ViaSat says commercial use of its 140 Gpbs (gigabits per second) satellite is expected to begin before the end of the month. In other words, the total bandwidth capacity of ViaSat-1 exceeds the combined data rate of all current Ku-, Ka-, and C-band satellites now serving North America, according to the company. ViaSat-1’s coverage includes North America and Hawaii, and is intended to provide high-speed broadband Internet service to WildBlue customers in the United States, Xplornet customers in Canada, and aboard JetBlue Airways’ domestic flights. The test transmissions were completed December 2 from ViaSat’s Carlsbad campus and relayed by the satellite to a ground station gateway in Milford, UT. 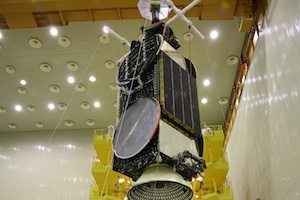 After testing has been completed in another week or so, ViaSat-1 manufacturer SpaceSystems/Loral will transfer operation of the satellite to the operator, Telesat. Meanwhile, ViaSat says it plans to complete the integration of its network of 20 ground stations, which will connect the satellite to the Internet backbone.